Depicts Parris Island, home of the Marine Corps Recruit Depot Parris Island. Port Royal Sound and Inland Passages South Carolina. This is a 1901 U.S. Coast and Geodetic Survey nautical chart or maritime map of Port Royal Sound in South Carolina. 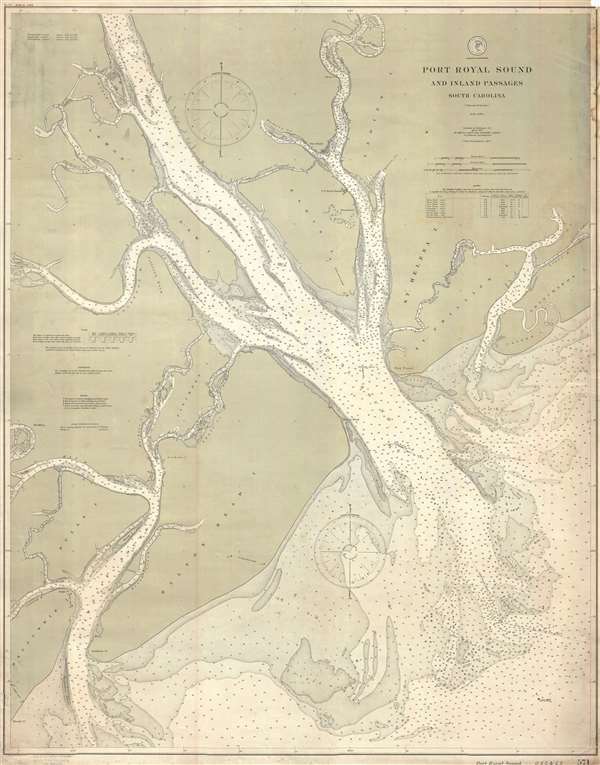 An estuary of several rivers, the map depicts the region from Daufuskie Island to Pritchards Island and from Beaufort, South Carolina to the Atlantic Ocean. The region's many rivers, inlets, and sounds are illustrated in detail with myriad depth soundings indicated as a navigational aid. Some of these rivers include the Colleton River, the Chechessee River, the Beaufort River, the Story River, and the Broad River. Creeks, inlets, and sounds are also labeled and include soundings as well. Numerous islands, such as Bulls Island, Hilton's Head Island, Daw Island, Lemon Island, St. Helena Island, St. Phillips Island, Caper's Island, and Paris (Parris) Island are labeled. Parris Island is where the Marine Corps Recruit Depot Parris Island is located. A table bearing information about lights is situated in the upper right corner, while information concerning tides, soundings, buoys, and storm warning displays is included in the lower left corner. This map was created and produced by the U.S. Coast and Geodetic Survey under the direction of Otto Hilgard Tittmann, who was a very highly regarded geodesist. It was engraved by Julius Bien and Company of New York. Otto Hilgard Tittmann (August 20, 1850 - August 21, 1938) was a German-American geodesist, geographer, and astronomer. Born in Belleville, Illinois, Tittmann attended school in St. Louis before joining the U.S. Coast and Geodetic Survey on November 10, 1867, and would remain with the U.S.C.G.S until his resignation 48 years later. Between 1889 and 1893, Dr. Tittmann was in charge of the Office of Standard Weights and Measures, which was, at this time in American history, part of the Coast and Geodetic Survey, and would remain so until the establishment of the National Bureau of Standards. During his time in charge of Weights and Measures, Tittman was sent to Paris to bring to the United States the national standard meter and to study weights and measures offices in Paris, London, and Berlin. Tittmann was named Assistant Superintendent of the Coast and Geodetic Survey on April 18, 1899 and was elevated to the post of Superintendent on December 1 1900, which he held until he resigned the post on April 15, 1915. Tittman, a co-founder of the National Geographic Society, served as the Society's President from 1915 until 1919. He was also a member of the Philosophical Society of Washington, the American Philosophical Society, the Washington Academy of Sciences, the American Association for the Advancement of Scient, the American Meteorological Society, the American Society of Civil Engineers, and the Cosmos Club. Dr. Tittman was a respected geodesist and renowned as one of the best in the country. Very good. Backed on archival tissue for stability. Light soiling. Blank on verso.